Last weekend I took a trip to Batsford Arboretum to see what autumn colours were on display in this Cotswold cornucopia of flora. As it happens, not a great deal, autumn is running pretty late this year, but there were very strong winds predicted for the next couple of days, so I wanted to catch what there was before it all blew away. It’s the first time I’d been to the arboretum at Batsford, despite it being no more than a 40 minute drive away, I’d always opted to go to slightly further afield to Westonbirt, its bigger, grander cousin. But despite Batsford’s modest 56 acres, it’s still one of the largest private tree collections in the country, and boasts quite an array of species, including the national collection of Japanese Flowering Cherry. The place has quite an interesting history, as the site not only contains the arboretum but also includes Batsford House, a huge pile of Cotswold stone that is still in private ownership, namely to the 3rd Baron Dulverton, so unfortunately is out of bounds for visitors. The earliest verifiable recorded history of Batsford Park, which includes the arboretum, dates back to the early part of the 17th Century. A house existed on the site which went on to be altered and extended over the next two hundred years. In common with most gardens of the time, the land was laid out in a formal style, gradually evolving into the more relaxed natural style, which would, eventually, become the arboretum as it is today. In 1886 the estate was inherited, indirectly, by Algernon Bertram Freeman-Mitford, whose passion for the oriental landscape directly influenced his design for the arboretum. On his return to the UK in the 1870’s, Mitford was secretary to the Ministry of Works which, at that time administered Kew Royal Botanical Garden. His long-standing friendships with three successive directors at Kew also proved to be of great benefit to Batsford. On inheriting the estate, Mitford moved permanently to the Cotswolds, and between 1886 and the early 1890’s, he knocked down the old Georgian mansion which stood in the grounds and built the neo-Tudor house that can be seen today. Mitford’s influence on the gardens was equally radical. He all but erased any trace of the old layout and created a wild garden of naturalistic planting derived from his observations in China and Japan. Many of the trees he planted at that time can still be seen throughout the arboretum. Following his death in 1916, Batsford Park was inherited by David Mitford – who moved into the house with his infamous family. Their time at Batsford was short though. The huge costs associated with running such a large house meant they were forced to sell it after World War I. But the Mitford Sisters, as they were known at the time, certainly left a legacy, with each one leaving their mark on English society, to a greater or lesser degree. Nancy settled in Paris after falling in love with a French colonel. She became a successful comic novelist and wrote ‘Love in a cold climate’ (the early part of which is set at Batsford), ‘The Pursuit of Love’ and ‘Noblesse Oblige’ published in the 1950’s. Pamela travelled to Ontario with her father on a gold prospecting trip and in 1935 drove to Czechoslovakia in a Morris 8. After a spell in Ireland farming and breeding horses, Pamela spent her final years in Gloucestershire surrounded by poultry, animals and vegetables. Diana caused a scandal by divorcing her first husband Bryan Guinness to marry Sir Oswald Moseley, founder of the British Union of Fascists, at a wedding attended by Hitler and Goebbels in Berlin in 1936. She was interned during the war in Holloway and Brixton Prison. She is also the mother of Max Mosley, former president of the Formula 1 FIA, whose particular brand of social gatherings caught the attention of the News of the World in 2008. This small horse chestnut is a direct cutting from the one outside Anne Franks hiding place during the Second World War. (Click on the picture to see a larger version) Unfortunately the brown of the leaves are not due to autumn changes, but from the attention of leaf miner insects. Thankfully the damage is not permanent. A frequent companion of Adolph Hitler for four years, Unity spoke at party rallies in support of anti-Semitic Nazi beliefs. When war was declared she shot herself in the head in Munich Park. The bullet lodged in her brain for nine years leaving her in a child-like condition and needing constant care from her mother. At nineteen years old Jessica ran away from home to join the Spanish Civil War. She later married Edward Romilly, a nephew of Sir Winston Churchill, and lived in the USA. Becoming an active communist and involved in the civil rights movement. After marrying the Duke of Devonshire in 1941, she worked with her husband as the main force behind Chatsworth House, writing books about her family home. Once the Mitford family were forced to seek smaller lodgings, the estate was bought by Gilbert Alan Hamilton Wills, later the 1st Baron Dulverton who, along with his wife, Lady Victoria took a great interest in the gardens, particularly the more formal areas and the walled garden. During the Second World War and in the years following the wild garden became overgrown and fell into neglect until Frederick Anthony Hamilton Wills succeeded his father as the 2nd Baron Dulverton in 1956. He replanted the garden and created the bones of the arboretum in its present form. His edict was simple: to collect the rare and the beautiful and to this end he introduced collections of Birch, Maple, Oak, Ash, Lime, Magnolia, Mountain Ash, Pine, Fir, Spruce and many other rarities. 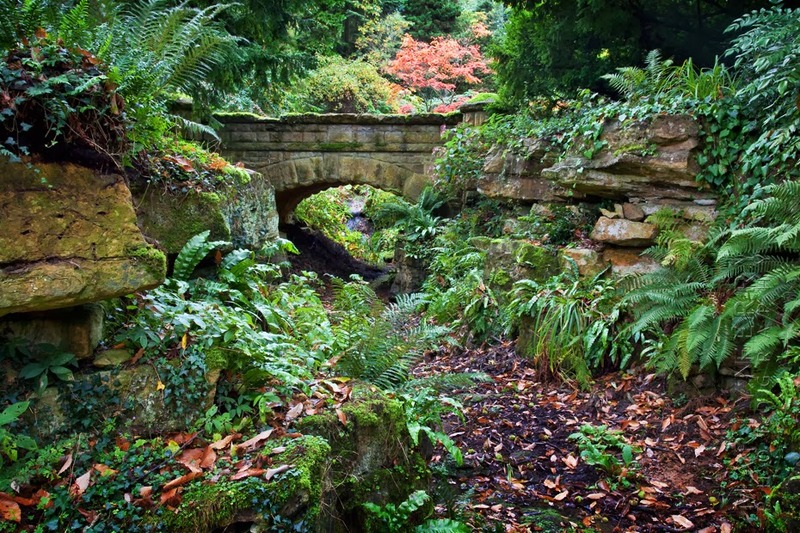 In February 1992 the 2nd Baron Dulverton died leaving the Arboretum in the hands of the Batsford Foundation, a charitable trust set up to promote research and education into conservation, gardens and architecture, and who run the arboretum today. Here are a few shots of single leaves among fir trees. I liked the way some of them were back lit by the sun.